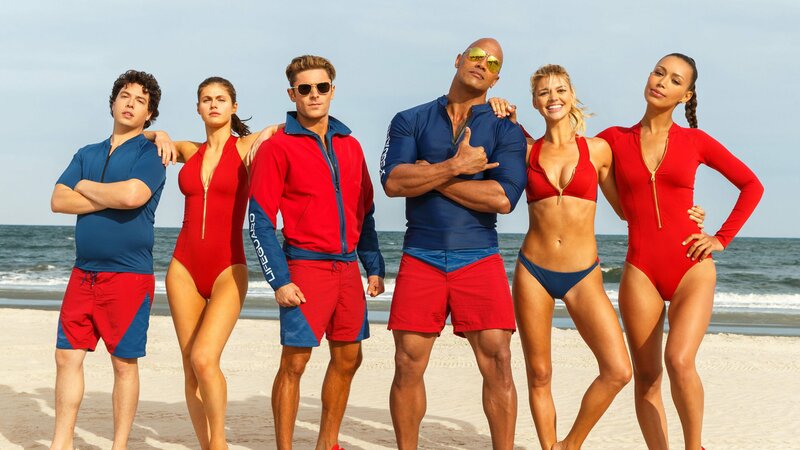 Baywatch takes the popular campy TV series of the same name in a somewhat new direction with this movie reboot directed by Seth Gordon (Horrible Bosses) and starring Zac Efron, Dwayne Johnson, and Alexandra Daddario. The film follows Mitch Buchannon (Johnson) as he and his lifeguard team uncover a criminal organisation operating from their Bay. I honestly didn’t expect a whole lot from this film, the trailers were somewhat amusing but it looked to be going down a typical action comedy route in the vein of the Jump Street films. And that’s more or less what we have here, the movie embraces a little of the campiness and focuses on trying to deliver an entertaining crime drama / action comedy. Now where it starts off pretty strong, keeping things very light hearted, with a large focus on the comedic side of things it loses its touch as it goes further and further down that more serious and dramatic crime ring direction which wasn’t all that interesting. As far as the humour goes there were a decent amount of laughs in here, most of which however were in the first 30-40 minutes of the movie. This is where the main crime driven plot is still taking shape and we are focusing on introducing the main characters and developing their relationships which made for some very amusing interactions. The dynamics between Johnson and Efron, Daddario and Efron, as well as Kelly Rohrbach and Jon Bass gave us entertaining characters that allow us to retain some interest in the latter half of the movie. The back and forth comedic dialogue and the constant joke after joke approach of the first 40 minutes was quite fun regardless of the fact that a few jokes here and there didn’t quite hit. I could’ve done with this for the entire film but of course they needed to go full force with the crime plot. Now when this plot does start to take centre stage it still had the possibility of remaining as some dumb fun with some jokes still coming through here and there, like a less interesting and less funny Jump Street film. But then it loses a lot of that fun aspect when it turns into a near straight up action film with the rock at the helm. It could have worked if this plot was well developed, engaging, and not predictable but it plays out very generically and you know exactly how it’s going to go. The lead villain is played by Priyanka Chopra and decently so, the character is very basic but that’s a product of the writing as oppose to the performance. The performances of the entire Baywatch team were very strong, all of whom were very funny when they needed to be and were by no means bad. So in the end there is some fun to be had with this movie, mainly when it embraces the light-hearted comedic side and puts that front and centre, utilising the comedic prowess of the talented cast. The crime plot is generic and i guess it serves its purpose but when that is the focus of the entire second half of the film you have a bit of a problem. If you want a good crime drama/comedy the Jump Street films execute everything much better than Baywatch but as a bit of dumb fun this movie can do the trick. Previous ‘TWIN PEAKS’ (2017) Season 3 Episode 17/18 – Right Back Where We Started After 18 Hours and 25 Years…. Next ‘IT’ (2017) MOVIE REVIEW – A Truly Phenomenal Modern Horror Masterpiece!